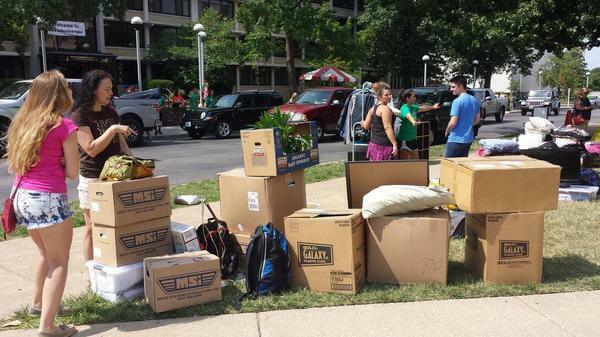 This is the college advice you need to know before you move into your new dorm room. With these five important steps, you’ll ensure that moving into your freshman dorm room is exciting, smooth and void of any major hiccups. Welcome to college! Some colleges and universities allow freshmen to bring cars while other campuses prohibit it. The same goes for other pleasantries you’re used to, like microwaves and refrigerators. Before you spend money on products like these, be sure that your school allows it. Create a college checklist for everything. Here are a few good ones: Dormify college checklist, Bed Bath & Beyond college checklist and Target college checklist. This is the best thing you can do to ensure that you are prepared for your first semester in college. Your college checklist should include things like absolute essentials (towels, comforters, and toiletries) as well as other necessary items to make your college dorm feel more like home (mini refrigerator, microwave, food). The beginning of your college journey is the perfect time to purge. What are the items that you already have that you absolutely must take and what are the items that you can leave at home or—even better—toss or donate? Clothing is a great place to start. Your dorm room is probably not as spacious as you’d think. So only taking part of your wardrobe makes more sense. You should only bring the part of the wardrobe you’ll use before you come back home. So when you first get to school only bring your summer and fall clothes. Then swap those for your winter wardrobe when you go home for Winter break. 4. Start to shop and keep organized! Now, the fun part: shopping! Start to mark the items off of your checklist and be sure to put everything in one central spot. This way, you’re not worried about whether you’re leaving something back at home. And, since you’re probably buying a lot of new things, be sure to keep the receipts in case you end up not needing them. This is also a great time to come up with a theme for your new living quarters. If you already know who your roommate is, you both can coordinate to create the best. Dorm. Room. Ever. We understand that acutally packing early is a hard task for the professional procrastinators out there, but it’s an important step that will help avoid that “Oh, no. I forgot something very important” moment. You should also decide whether or not you’re going to hire professional college movers. They’re a great choice for students who are particularly nervous (we make moving into your new dorm super stress-free), students who have tons of stuff to move into their new dorm (went a little overboard at Target or Bed Bath & Beyond?) and for students who just “can’t” with the idea of lugging their belongings up loads of steps into their new freshman dorm room. Get a quote on professional dorm and college movers here.